Back to School Night is this Thursday! 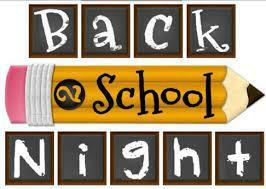 All parents are invited to attend Back to School Night beginning at 6 pm for zero period and 6:15 pm for Period 1. Click here for more details. This will give you the opportunity to meet your child’s teachers and become acquainted with the educational program he/she will be a part of this year. Each teacher will present an overview of the year’s work. With this in mind, please do not plan to ask specific questions regarding your student. Teachers will be providing their telephone extension and/or e-mail addresses for this purpose. We will have additional parking on our blacktop (back of the school). This program is for parents only. Please do not bring your student with you to the event. We look forward to seeing you!